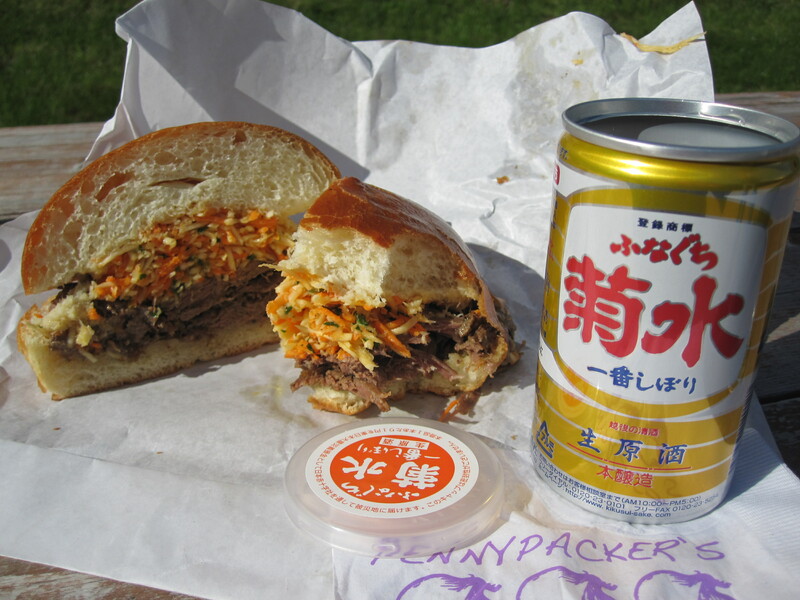 Home » sake and food » sake in my pocket #1. pennypacker’s food truck. south boston waterfront. 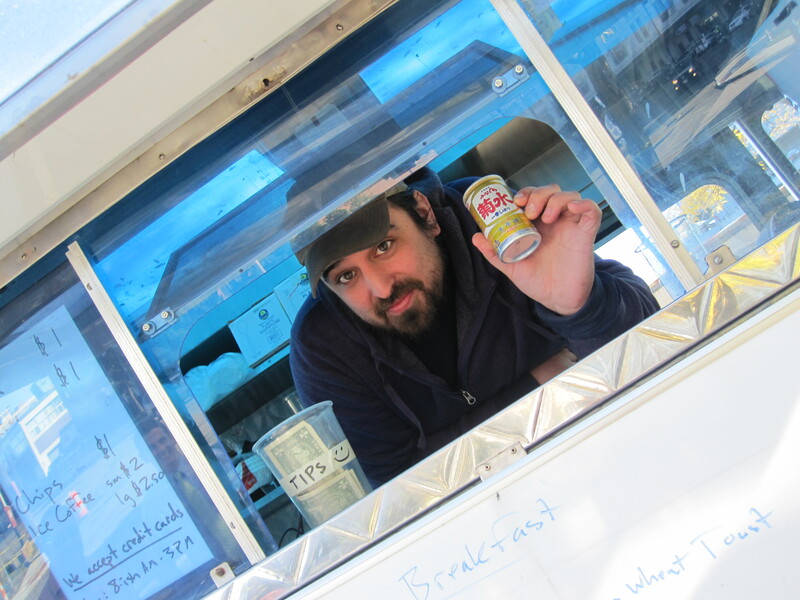 sake in my pocket #1. pennypacker’s food truck. south boston waterfront. Unless you live in a cave with no internet, you are aware of the current food truck craze going on in the U.S. With its early epicenters in L.A., Portland Oregon and NYC, high quality food trucks can now be found in every metropolitan area and a few trucks in places more out of the way. The modern food truck owes its origin equally to the classic chuck wagon of the late 19th century cattle drives and the classic “roach coach” of the 1950’s and 60’s. Both were created to serve a largely blue-collar working class crowd, usually on-site and away from traditional eateries. In the last 10 years with a faltering economy and a rising cultural interest in street food, many young chefs have found a solid business and unbridled creativity in having a food truck. Since the modern food truck churns out fantastic and often spirited food, I was inspired to pair various trucks around Boston with some portable Sake. Unlike some of the preconceptions about packaging that we have in the U.S. (screw top wine, boxed wine etc.) Japanese brewers offer high quality Sake in a plethora of packaging types. With no rules against public drinking in Japan, some Sake containers are made for portability while keeping the quality of the Sake secure. Kikusui Brewing in Niigata has been making canned Sake since 1972. In the late 1960’s Kikusui was looking for a way to package unaltered cask strength Sake to the general public. The biggest hurdles to packaging unpasteurized Sake is that it does not react well to oxygen or light. By using a can, there is no danger of UV light and cans are known to have lower dissolved oxygen levels than bottles. After 3 years of trial and error a successful canned fresh Sake was made available called Funaguchi Ichiban Shibori. The big, bold unpasteurized full strength Sake was an instant hit not only because of its full flavor and clean aromas, but due to the convenience of the can as a package. As the weather here in Boston has turned cold, my choice for the first food truck pairing was obvious; I reached for the fresh flavor and bold character of Kikusui’s original canned Sake. 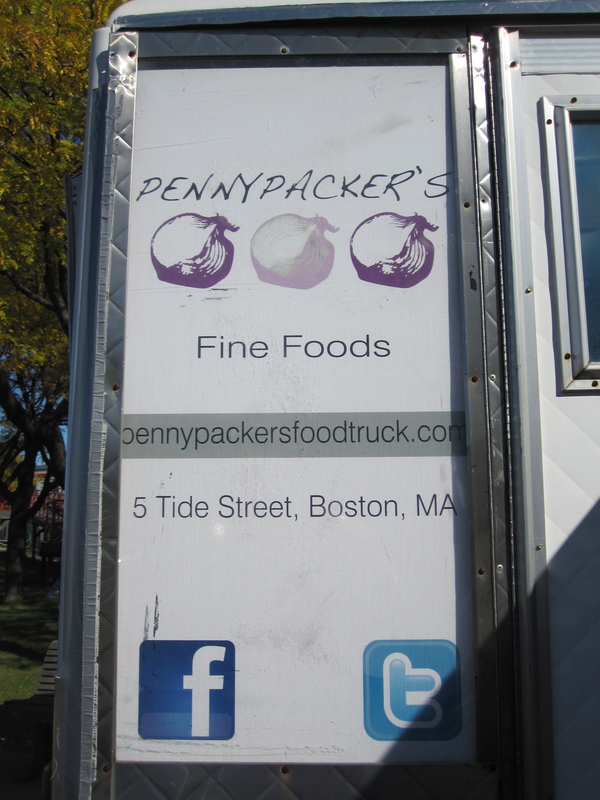 The Truck: Pennypacker’s Fine Foods – located on Tide Street in the Marine Industrial Park in South Boston. Open 8am – 3pm. The Sake: Funaguchi Kikusui Ichiban Shibori – The original unpasteurized canned Sake. Honjozo, 70% rice milling rate, 19% alcohol. When pairing food with Sake, I’ll admit that my mind doesn’t readily jump to soups. I was pleasantly surprised that this pairing was a great idea considering I ordered the soup on a whim. The rich, thick base of split yellow peas stood up to the full body and massive presence that this Sake brings to the table. In a supporting role, the Chorizo sausage provided a savory layer to the soup and lent a touch of smoke and spice. It was this smoke and spice mixed with a touch of herb (thyme?) that really brought out the complex anise and black pepper notes of the Sake. The pairing ended with clean rice flavors and a lingering sense of herb-like thyme and spice from the soup. A full-body warming that was pleasant in the cold biting wind made this a great pairing for any autumn outdoor activity, perhaps a last minute picnic or just some time on the back deck. Genshu Sake are full bodied, flavor forward and higher alcohol than typical commercial Sake. For this reason you need some bold flavors to stand up to them in a pairing; enter the beef short rib sandwich at Pennypacker’s. 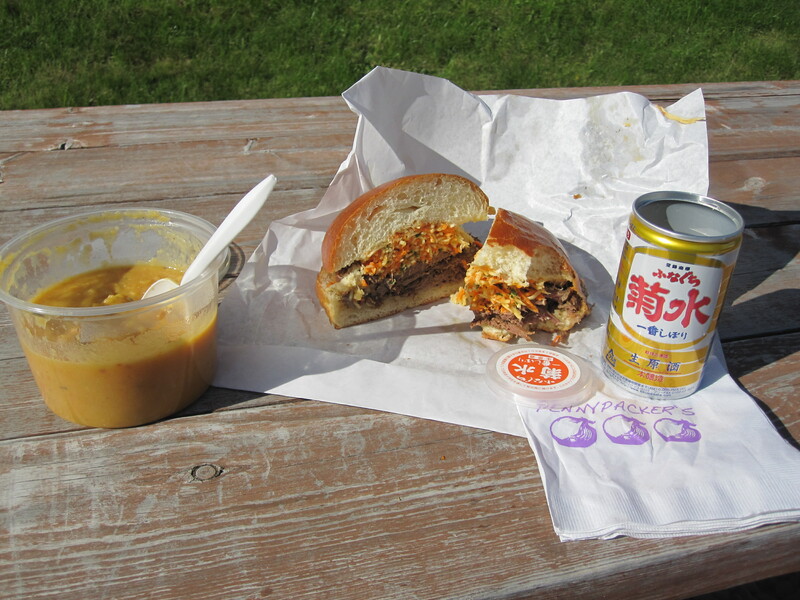 This sandwich is not timid in it’s approach and it made a great pairing for Kikusui Funaguchi. The sandwich starts off with a formidable pile of beef short rib, cooked to tender perfection. This modest cut is not a delicate piece of beef, but cooked like this it brings incredible beef flavor that blended perfectly with the higher alcohol and huge body in this Sake. The moist, tender beef and Sake alone would be a great pairing, but added to this flavor roller coaster was a complex slaw made from parsnips, carrots, vinegar, and a hint of honey. The natural sweetness that the slaw brings melded with the rice sugars in the Sake and, instead of muddling the flavors, elevated the beef and Sake duet to new levels. The wild card player here was definitely the horseradish mayonnaise. I wasn’t sure what to expect from this spicy kick of horseradish but it really works in this sandwich and the spicy finish actually highlighted the spice notes of the Sake along with a dual burn of alcohol and horseradish bite. With this intricate balance of spice and sweet, you really were able to appreciate the background sweetness of the Sake along with the natural sweetness of the root vegetables and horseradish. Lastly, the fresh locally made bread brought some light, slightly sweet grain notes that went well with the clean rice notes in the Sake. This pairing was perfect for the 45F windy day, both the food and Sake brought bold warming flavors to keep the chill at bay. It was refreshing to see how well Sake paired with the food from Pennypacker’s; cementing the idea of Sake’s versatility as a food friendly beverage. Stay tuned to this blog for more mobile Sake pairing, as I do my best to show the variety of Boston food trucks and the flexibility of portable Sake.